Sgt. Jonah Ellens & Corporal Jeffery Parent of the 100th Regiment of Foot (Reenacted) stand at attention while Museum Chairperson Ken Cownley, left, and Vice-Chairperson Linda Preston, right, present Kathryn Jamieson with a parting gift. After six years as Curator Manager of the Goulbourn Museum, Kathryn Jamieson has accepted a position with the Town of Perth as its Heritage Tourism Manager. Ms. Jamieson started working at the Museum in 2008 and was promoted to the role of Curator Manager in 2012. She successfully took on the challenge of transforming the museum into a community hub whose attendance has increased by over 220% in the years that she has been at the helm. Her achievements were recognized in 2016 when she received the Promising Leadership Award of Excellence from the Ontario Museum Association. “I’m looking forward to this new opportunity but I am going to miss my colleagues and the network of people I’ve come to know in Goulbourn that care about the Museum and care about heritage,” says Ms. Jamieson. 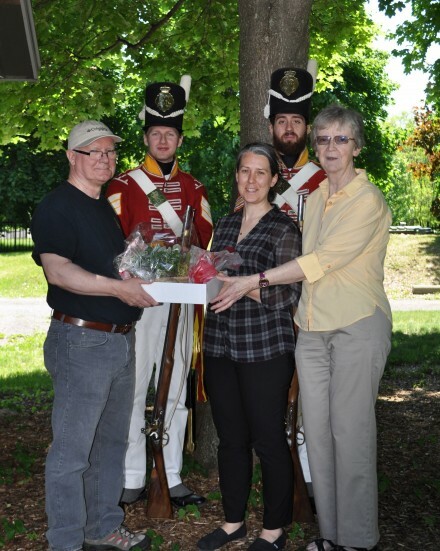 Some of her proudest accomplishments include her first major project grant – the Museum’s wildly successful War of 1812 Commemoration – securing a significant sponsorship from Minto, and more recently, the Museum’s renovations. “After years of dealing with drastically uneven floors and asking for the City’s help, it finally happened! The new floors are beautiful and I’m thrilled I got to see the finished product,” she says. To ensure a smooth transition, Tracey Donaldson has been appointed the new Manager of the Museum. The former Education Officer has been with the Museum for 11 years and recently completed 15 months as Acting Manager while Ms. Jamieson was on parental leave. “The Board has every confidence that the Museum is in great hands,” says Mr. Cownley. Ms. Jamieson’s last day at the Museum is Monday, June 4, 2018 but she plans to stay connected to the organization as a member.